Brightly colored streamers line the mess hall. Amy, one of our marine technicians, places a Funfetti cake, covered in homemade whipped-cream icing and sliced peaches, on the table in front of me. She lights a solitary candle (in the confined, dry environment onboard, fire is a major hazard.) I blow out the candle, feeling like a kid on Christmas morning. Today is March 2nd , 2018—my 30th birthday. It is also my 15th day living aboard the Laurence M. Gould in the Antarctic Peninsula. After lunch, I run into KC in the hallway. I have only known KC for the two weeks we’ve been living on the ship, but he has quickly become a close friend. KC keeps the mood light as we transit from the ship to an island on a zodiac boat. KC’s enthusiasm warms my heart in a profound way. Over the past few years, my birthday celebrations have included surprises, concerts, dance parties, and travels with friends. But on a research vessel in Antarctica, the celebratory options are a bit limited. After a long day of field work, KC and I don our comfiest clothes, grab some leftover birthday cake from the mess, and head to the lounge. We put on Into the Wild and plop down onto the worn-out, oversized leather couches. An hour into the movie, as we watch the young Alexander Supertramp cooking a squirrel over a fire in the backcountry of Alaska, the ship lurches. KC and I have to catch ourselves, so we don’t roll off the couch. I laugh as I steady myself. I was so immersed in the movie that I forgot—just for a few minutes—that I’m on a ship at the bottom of the world. Several people on the ship have cool tattoos, but this one is my favorite. This statement jolts me with far more energy than coffee ever could—I suddenly feel wide awake. Twenty minutes later, Hans and I have exchanged stories of climbing volcanoes, getting tattoos, traveling around the world, and how and why these things make us feel so alive. The sun went down almost an hour ago, but the sky continues to radiate deep hues of blue and red. A warm breeze washes across the storage deck, enticing me and the other crew members to linger here a little longer. I scroll through the sunset photos on my camera, comparing shots with Leighton, our lead marine technician. Luke, our second officer, sits on an overturned bucket, quietly strumming his guitar. Rumor has it that Luke is quite the musician, but I’ve never heard him play. Because he reports to work on the bridge at midnight (until 4am) Luke typically uses the early evening hours to rest. It’s a pleasant surprise to see him here now, especially with his guitar in hand. A couple people fire off requests. After a brief back and forth, Luke begins to strum the chords to a song that, for me, acts as a time warp. The year is suddenly 2008 and I’m a sophomore in college, sitting on a porch in Carrboro. The reality is that it’s 2018 and I’m on a ship in the Pacific Ocean, over 2,500 miles from North Carolina. But listening to Luke sing, I feel right at home. Luke MacNutt serenading his fellow crew members as the final light of the day fades behind him. Just after 10pm, the lights on the Coronado bridge send twinkling reflections across the smooth surface of San Diego Harbor. I stand on the aft deck with Leo, one of our deckhands, and Lou, one of our chefs. We stare out over the water, exchanging stories. Today marks the end of my fourth expedition this year. While I just celebrated my 100th day at sea, Leo and Lou have spent thousands of days working on ships. Tomorrow Lou will begin two months of travel across the U.S. and Mexico before she returns to her native New Zealand. Leo is heading home to his family in Latvia. I’m going back to North Carolina. “The first week is always rough,” Leo says, describing the transition from the daily routine and order of the ship to the chaotic joy of life at home with his two young boys. Leo smiles over his morning cup of coffee during our seventh week at sea together this summer. I listen and nod in agreement. While I have no idea what it’s like to be a parent, I can empathize with the strangeness of the transition. When I got home after three months of travel this summer, it took me the better part of two weeks to adjust. I wonder how I’ll feel when I return to Chapel Hill this time. Exactly 24 hours later, as I board a red-eye flight bound for the east coast, I experience the sensation of stepping into a portal. I am hit with the sudden realization that I now inhabit two parallel worlds, with completely different sets of people and experiences in each. Both brim with beauty, challenges, and lessons—but they exist apart. There is my life on land, and then there is my life at sea. 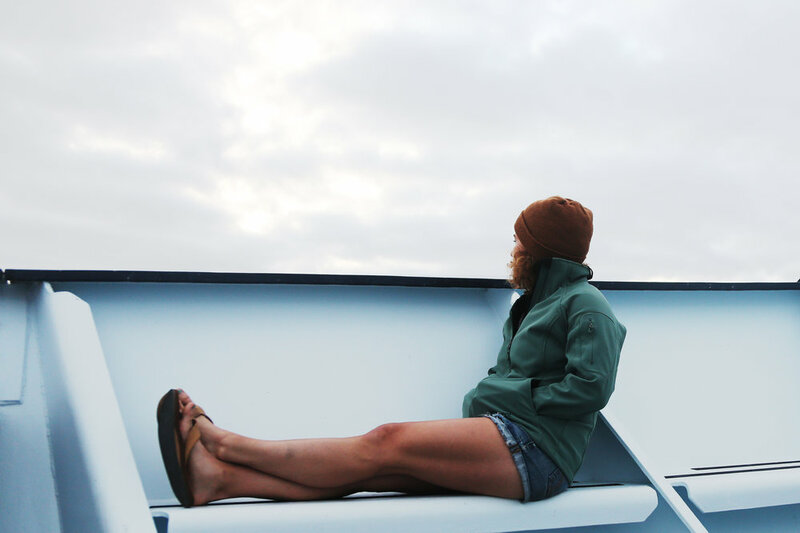 Lounging on the bow of R/V Falkor on my 84th day at sea this summer. Join us on November 16th at the shop for Adventure Friday with Marley Parker. Read of Marley’s writing on her blog at ML Parker Media.